Mother’sorder ran a soup kitchen in Norristown, PA, and Theresa worked there. WhenTheresa later ran a youth group, she brought the kids to work there. Duringa difficult period after I broke my foot, I prayed for a miracle, for her toheal me. I felt a full body tremor. I had hoped my miracle would count for hercanonization but she intercedes for a lot of people. I’m just really happy thatshe’s going to be a saint. She already is a saint. Thisis the testimony of Sue*, aged 47, about how her abortion affected her life. WHENI was 20, I met a young man and we started a relationship. Wemoved in to a flat together and it was an intense beginning to early adultlife. Myboyfriend told me often that he loved me and there were numerous romanticgestures he showered over me. However,he would often put me down with mean words, take money from me so he could takedrugs and he rarely had a job. Iknew something was wrong though I didn’t know what to do about it. Afterour one-year anniversary, I fell pregnant and I was excited that something goodhad happened to me – the girl with anxiety and a boyfriend who was inconsistentwith his love and actions. Whenthe doctor gave us our results, my boyfriend turned to him and said, “How do weget rid of it?” My first thought was, “I’m not getting rid of it” although Ididn’t verbalise it. Wedrove home and I looked up a women’s health book and found a page about thegrowth of embryos. Iknew it was already the size of a grain of rice and was beginning to developinto a foetus with a heartbeat. Iread this out loud to my boyfriend who said, “Don’t look at it”. Ikept quiet about my pregnancy and, having moved states, I hadn’t made friendsyet. Iwas estranged from my family and didn’t confide in them about my situation. Myboyfriend organised appointments at an abortion clinic which I refused to goto. Oneday he put me in the car and drove me there. Idon’t know what day it was, what time or where I went. Iwas extremely anxious and couldn’t think straight. Hedropped me off outside a surgery and drove off. Istood there, alone, looking at the building. I felt I would collapse. Iwas so traumatised and I was scared that my emotional overload might kill meright there on the spot. Itwas the mid-1980s and I had no money, no friends, no family support and nowhereto go. Howhad I arrived at this point in my life? Somethingpropelled me inside the door and before the abortion procedure I felt sick. Thedoctors went ahead with the procedure and I woke up from the anaestheticvomiting. Iwasn’t only physically sick, I felt sick in my soul and heart. Howwould I live with myself? Myboyfriend picked me up and we went back to our little flat. I was heartbroken. Ourrelationship quickly deteriorated and he became abusive in every way until fouryears later I finally left. Atthis point, I had an emotional and mental breakdown and was close to beinganorexic. Whathad happened to my life? Ihad been so traumatised from enduring a forced abortion that I had loads ofemotional and physical issues. Thedepth of the trauma was so powerful that I forgot I had gone through thisprocedure. Itwas 15 years after the event when I was 35 that I was at church and reminded ofthis horrible experience. Iswayed as I walked with the realisation of what happened and I found a chair tosit in before I collapsed. Astime went by, I heard of a healing retreat that healed women and men from thetrauma of an abortion experience. Iresearched a great deal about the retreat and, with a new-found faith that hadhealed much of the sadness in my life, I had another step to go. SoI went to a Rachel’s Vineyard retreat for the weekend and found the healing andfreedom I had long wanted for nearly three decades. Therewas a small group who gathered to share their stories of having been through anabortion and we all empathised with the other’s experience. Therewas a lot of acceptance and love shown to all the women in this predicament bythe leaders of the retreat. Theywere kind, supportive, understanding, listened and were non-judgemental. Theywalked us through a process of being set free from the trauma of ourexperiences. Itwas a safe place to be and there was respect for each person involved in theretreat. Onthe Sunday afternoon when the retreat was finished, my life did a 180-degreeturn to the road of forgiving myself and being set free from the abortion. Ihonestly felt liberated and happy deep down in my soul and spirit. It was awonderful and new feeling that set me free. Itis a liberating experience to attend a Rachel’s Vineyard retreat that is set ina loving, non-judgemental environment. Iknow that if you have lived with the regret and trauma of having an abortion,Rachel’s Vineyard can help you too. Theresawas interviewed by Kim Ketola on the show ‘Cradle My Heart’. Theleaves are falling and the weather is becoming crisper, friend and familiesbegin to gather for the holidays ahead, rooms are full of laughter and love,but there are some who are alone and aren’t able to laugh with their friendsand families due to the pain they are in since their abortion experience. Considermaking a donation to Rachel’s Vineyard, your generosity may enable someone tofind healing after abortion. Rachel’sVineyard Ministries is a non-profit organization. We are able to minister to thosehurting after abortion through your contributions and prayers. As we approach our national elections, the work of Rachel's Vineyard continues,in a completely non-partisan way, to raise awareness -- includingin the minds and hearts of politicians and candidates -- about the damageabortion does to women, men, families and our entire world. 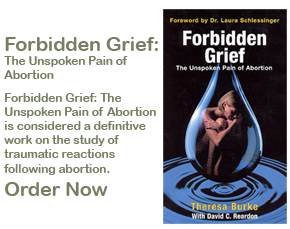 In fact, as peopledebate about abortion and public policy, the awareness of the wounds thatabortion brings continues to grow, and can influence public policy, and thedecisions of public officials as to whether they think abortion shouldcontinue. For more information and to find ways to help promote this event pleasesee iwopf.org. Social Media offersus a unique way to reach out to those who might not otherwise hear of thehealing available at Rachel's Vineyard. Click the links below to visitRachel’s Vineyard social networking sites. Join today and share with yourfriends and family! Please pray for the repose of Anne Sherston’s mother, Josephine, whopassed away on August, 7, 2016. Anne said, “Her long journeyis now complete. Thank you all for your prayers and support.” Please keep Anne,Josephine, and the rest of their family and friends in your prayers. Please pray for the repose of Jim Easton’s soul. Jim lost hisbrave battle with brain cancer. He and his wife Mary have been prayer warriorsfor the Fresno team since they began in 2002. Please keep him, and his familyin your prayers. Please pray for the repose of Shelly Stone's soul. Shelly wasa champion of Rachel's Vineyard and helped to train many of our sites. She wasalso active within Grief to Grace. Please keep her family in your prayersas well. Please pray for Anne Neville's son as he battles stomach andliver cancer. Anne is a Rachel's Vineyard team member from Hobart, Australia.